PRO TIP: Don't come for the entire cast of a popular TV show on Twitter. It is a known fact that Riverdale fans are some of the most passionate TV stans in the game right now. But sometimes, they can get a little *too passionate* about their favourite cast members. 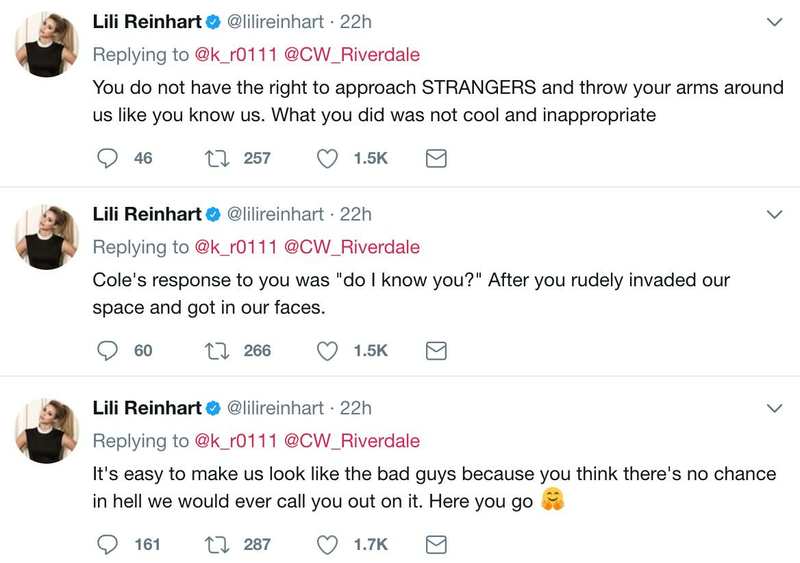 Lili Reinhart took to Twitter yesterday (Sept 4) to defend herself and her fellow cast mates against one of those "fans" who called them "disgusting and rude" after an awkward encounter. According to the tweets from the fan, the cast was hanging out in Downtown Vancouver when she spotted them and decided to go and approach the group. The fan said that she "loves the show" and that she was "kinda drunk" when she approached the cast. When the cast didn't respond to her with as much enthusiasm as she liked, she tweeted, "basically moral of the story downtown vancouver is trash and the cast of @CW_Riverdale are disgusting and rude." 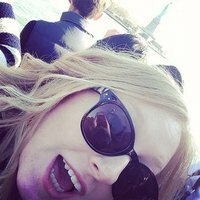 She carried on with the tweets - with Riverdale's official Twitter account tagged - writing, "you know you're signing up for public to talk to you otherwise just quit." Lili then caught wind of the tweets and she replied and boy, she did NOT hold back. She called out the fan for acting inappropriately and even dragged her for lying about what Cole actually said. This is just the latest incident in a bunch of scary situations the Riverdale cast have found themselves in involving "fans" of the show. Madelaine Petsch recently spoke out about the moment a fan jumped on her in public and Vanessa Morgan (season two's Toni Topaz) revealed that she had been receiving death threats over her character's potential relationship with Jughead. REMINDER: Actors are not the characters they portray on screen, they are real humans who deserve to be respected in public. So we guess the real ~moral of the story~ is... maybe don't act so entitled next time? They don't owe you anything.